Large and mid-sized companies looking to avoid stagnation by growing and expanding need to execute effective mergers and acquisitions (M&A) deals with sophisticated strategies, solid structures, and beneficial outcomes for everyone involved. 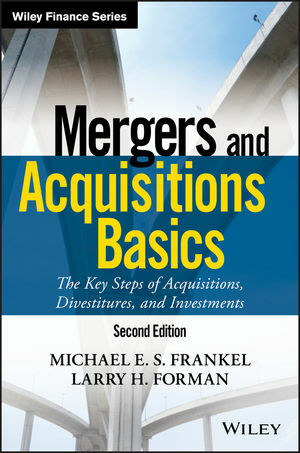 Mergers and Acquisitions Basics, Second Edition, is the up-to-date, dependable road map for navigating all the variables, roles, complexities, and potential pitfalls of this essential business transaction. Get to the heart of this strategic transaction and make it work for you in the real world with Mergers and Acquisitions Basics, Second Edition. Mergers and Acquisitions Basics provides complete guidance on the M&A process, with in-depth analysis, expert insight, and practical tools for success. This new second edition has been updated to reflect the current M&A landscape, giving busy executives the ideal resource for navigating each step in the process. Veteran executives relate guidelines, lessons learned, and mistakes to avoid as they explain how M&As work, identify the major players, and describe the roles involved in a successful transaction. Both buyer and seller must consider a broad range of factors, and this essential guide provides checklists, forms, sample reports, and presentations to help you avoid surprises and ensure your organization’s full preparation for the deal. Equity investments, valuation, negotiation, integration, legal aspects, and more are explained in detail to provide a foundational primer for anyone seeking to clarify their role in the process. Mergers and acquisitions are becoming ever more critical to the growth of large and mid-sized companies. This book balances depth and breadth to provide a one-stop guide to maximizing the financial and operational value of the deal. Effective M&As are highly strategic, solidly structured, and beneficial on both sides. It’s a complex process with many variables, many roles, and many potential pitfalls, but navigating the deal successfully can mean the difference between growth and stagnation. Mergers and Acquisitions Basics is the comprehensive resource every executive needs to understand the ins-and-outs of strategic transactions.